NAMIE, FUKUSHIMA PREF. 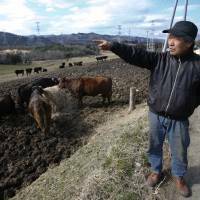 - Since the 2011 meltdowns ended their future as prized black wagyu beef, a rancher near the Fukushima nuclear power plant has given his cattle a new mission: They’ve become protesters. 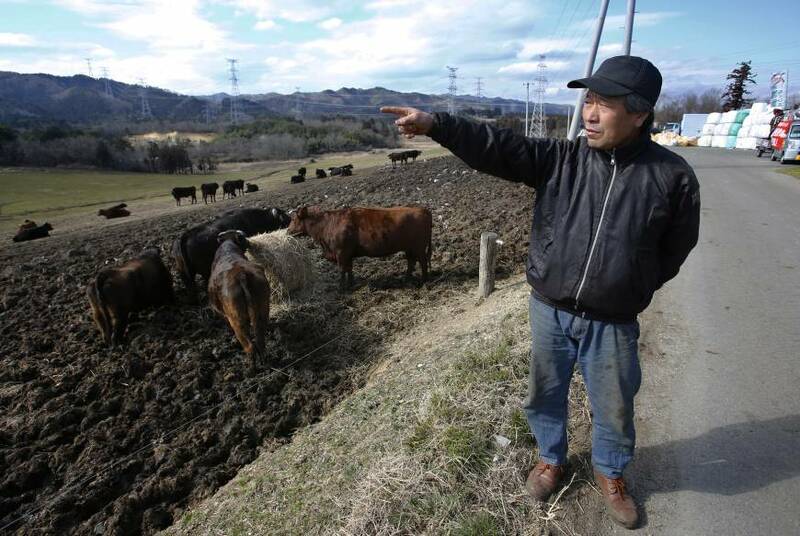 Defying both government evacuation and slaughter orders, 62-year-old Masami Yoshizawa returned to his ranch 14 km from the plant to keep his cattle alive as living proof of the disaster. He and his cattle are no doubt a nuisance for the government as Japan gears up to showcase Fukushima’s recovery ahead of the 2020 Tokyo Olympics. The March 11, 2011, earthquake and tsunami swamped the Fukushima plant, knocking out power to vital cooling systems. When Yoshizawa heard explosions at the plant, he feared the ranch he inherited from his father was finished. Within weeks, thousands of cattle in the evacuation zone around the plant died of starvation, including 200 of the 330 Yoshizawa had left at his ranch. Memories of the rows of dead cows at abandoned farms, collapsed after being reduced to skin and bones while waiting for food, still haunt him. Surviving cows that escaped their ranches were roaming for food, damaging houses and disrupting traffic. Two months after the accident, the agriculture ministry ordered their slaughter, to keep their meat from secretly entering the market. Neighborhood ranchers were divided. “I said I was not going to let any more cows die on my ranch,” Yoshizawa said. His mostly lone resistance hasn’t been easy. Authorities tried to block his feed transport, and kept trying to persuade him to kill his cows. The location of his ranch, on the border between two towns — Namie and neighboring Minamisoma — may have worked in his favor. Both towns have looked the other way and virtually given up. A prefabricated hut on a driveway to the Ranch of Hope — which Yoshizawa renamed after the accident with the hope of establishing a nuclear-free society — serves as a tiny office for what he calls his “nuclear rebellion.” Skulls of cattle that died early in the crisis decorate the exterior. His cows keep him company, mooing and grazing. Radiation levels at the ranch measure about 10 times the safe benchmark. Yoshizawa has taken DNA tests twice and had his exposure level checked 20 times. So far, no major health problems have been detected. Yoshizawa is not married and his relatives now live near Tokyo. The cattle population at Yoshizawa’s ranch has grown back to 330, as he took in homeless cows from the neighborhood and other farms. They live on contaminated feed donated from towns in the area, which he said is the most ecological way to get rid of radioactive waste. Over the past year, some of the cattle have developed tiny white spots on their bodies, which Yoshizawa believes is linked to radiation from eating contaminated grass and feed. Scientists he works with, however, say the livestock have a good appetite and that the spots could be stress-related. The cattle undergo health checks once a month. Tohoku University pathologist Manabu Fukumoto, who has been monitoring the cattle, said the animals’ internal organs and reproductive functions showed no significant abnormality linked to their radiation exposure, and that other studies, including the impact of radiated feed, are underway. He urged further monitoring and dose evaluation, citing a spike in thyroid cancer cases in Chernobyl a few years after the 1986 accident. Within one year, the government plans to open part of his town of Namie for residents to return. The town predicts only one-quarter of its current population of 19,000 will come back, most of them senior citizens, as has been the case in other reopened towns. Families with children face a higher radiation risk, and surveys show about half of the remaining 100,000 Fukushima evacuees have decided to resettle elsewhere. Yoshizawa plans to stay at least another five years — or as long as his herd lives.